Agnes Akello lives in Kiryandongo District, Uganda. Her husband is a subsistence farmer, growing maize, beans, and plantains. This provides just enough to feed their family of five, but not enough for a nutritious diet. 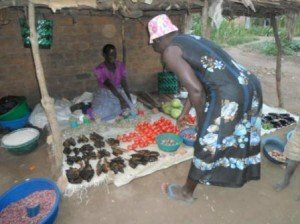 Agnes used to make a small amount of money by selling tomatoes and fish at a road side market to passing motorists, but the family was struggling to make ends meet and provide basic necessities for their children. 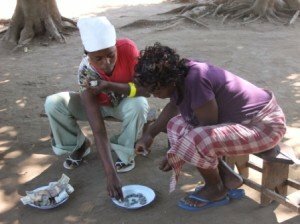 When ChildFund began working in her community, one of the things they did was to set up a Village Savings and Loan Association (VSLA). A VSLA is a group of 10 – 25 people who save their money together in an organised way. These savings are used for a Loan Fund, from which members can borrow money to help them set up or expand a small business, and a Social Fund, to help members of the community in distress. 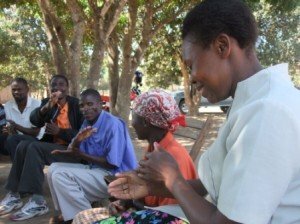 ChildFund provides training for these groups to help them manage the association sustainably, but once set up, they are completely member-managed. Below, another VSLA group counts the week’s savings and applauds the highest-saving member of the week. When Agnes heard about the VSLA, she joined and later borrowed 400,000 shillings (about €120). “I would never have been able to access this amount of money in my village”, she told us. Agnes used the loan to start a sorghum selling business. She buys the sorghum (a local grain) during the harvesting season when it is in plentiful supply and sells it at a higher price during the dry season. She also expanded her petty trade business, pictured here. Agnes’ businesses allowed her to repay her loan and increase her savings, meaning other members could take loans and emulate her success. She has become such a role model that she was elected Chairperson of the group, which now has a loan portfolio of almost €1,000. But she takes even more pride in the contribution she can now make to her family’s well being. “My greatest joy is in seeing my children go to school, get good medical services, and proper food and clothing, which were all very difficult before”, she says with a smile. ChildFund takes similar pride in helping people like Agnes transform their lives. But our greatest joy comes from seeing those people take on leadership roles in their communities and spread the benefits of development further than we ever could alone. We feel privileged to play a role in this process of community development, and thank our sponsors for making it all possible. If you’d like to share in our pride and joy at the next success story, consider sponsoring a child today, and watch the benefits spread out like ripples across a pond.